This Hawkridge Golf and Country Club wedding photo was taken during the reception at the indoor facility. It was such a lovely moment as the speaker is the bride's father who apparently suffers from anxiety as well as memory loss. He claimed that he rarely gets up in front of a crowd and, on the rare occasions it does happen, he tends not to remember the event the following day. In his speech, his message came straight from the heart. To both of his daughters -- the bride and maid-of-honour at the wedding -- he apologized for not having been more present in their lives, especially as children. He said he regretted not having watched them grow up into the beautiful ladies sitting at that table at Hawkridge, in Orillia. Clearly moved, the maid-of-honour was quite emotional for the entire duration of the speech. Capturing her father talking was, of course, my highest priority. Capturing her reaction, however, is arguably most important. 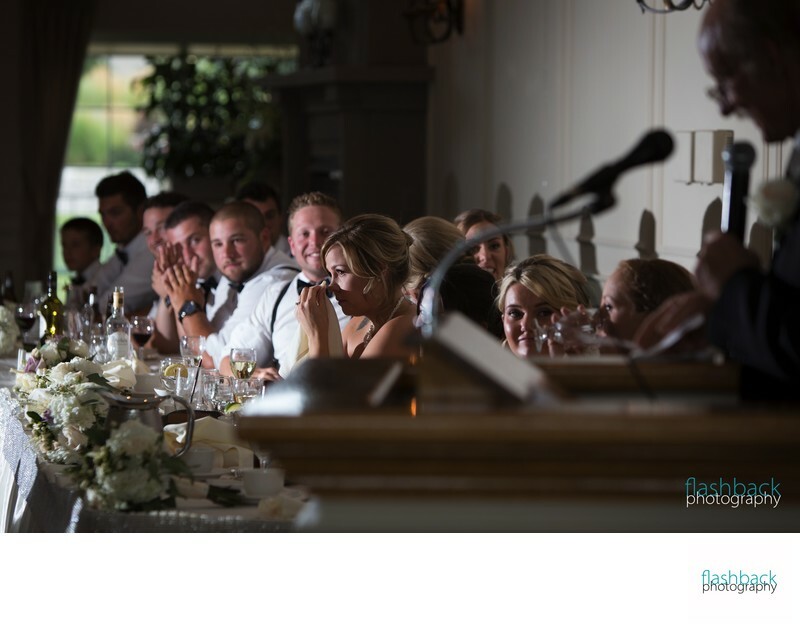 When the bride sees this photo from her wedding, she will experience an instant that she did not have the opportunity to witness first-hand, as her focus was on the speaker at the time.